Use a Raspberry Pi Zero to notify you when your laundry is done #piday #RaspberryPi @Raspberry_Pi « Adafruit Industries – Makers, hackers, artists, designers and engineers! These instructions are for a simple Raspberry Pi project that can make any old appliance smart, without having to operate on the appliance. Just stick this tiny device onto it! This device makes use of the nicely sensitive 801s vibration sensor. It will detect faint shaking and if the shaking lasts a specified amount of time, it will assume that the appliance is running. This works on clothes washers and dryers, dishwashers, garage door openers, fans, furnaces, and other machines that vibrate. 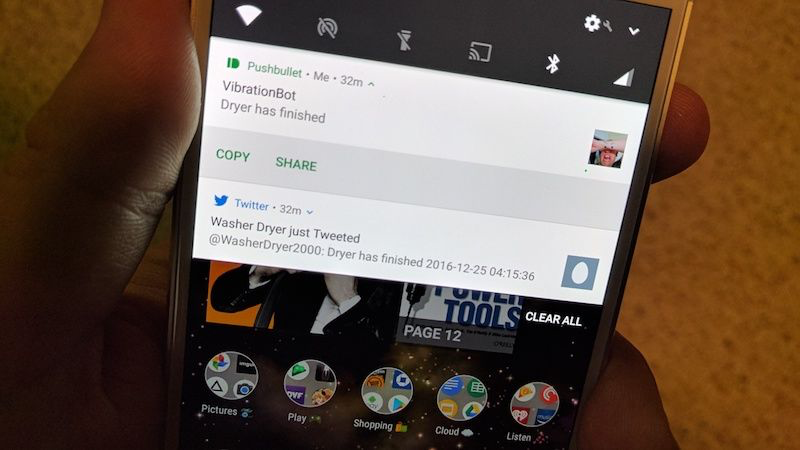 You can receive tweets or PushBullet notifications when a device starts vibrating or when it stops.